Lake Anna Striper Guide Journal: Stripers are Rockin! Today we caught bait early and hit the water at first light. 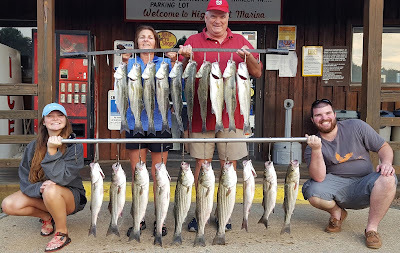 It didn't take Tony long to find the Stripers so he called me to him. 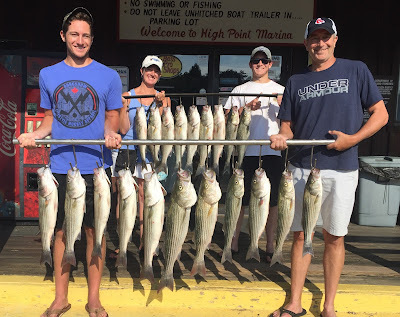 By the time I got there they had fish all over the deck and still reeling in more! We teamed up with him keeping on the school. Once he lost them I would get them then I would loose them and he would find them. By 7:10 Tony's crew had their limits and were headed back to the marina. They got back in time to clean their fish and go out to a nice breakfast. 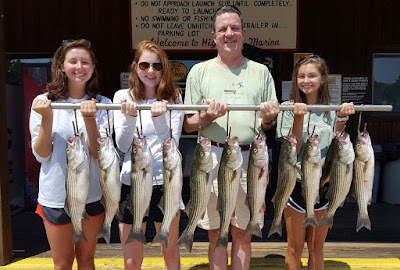 My group took a little longer but once they got it they enjoyed the madness of power fishing for Stripers. When all of us got back to the marina most fishermen were just putting their boats in the water. We got off the water before the heat and traffic could affect fishing today. Good Day on Lake Anna.